When you come to visit us at Coverdales, you will be met with a friendly reception and guided through the eye examination process in an unhurried atmosphere where tests will be fully explained and you will be encouraged to ask questions. If a prescription for spectacles is required, you will be assisted in your selection of lens and frames which will best balance your needs and your budget by our fully qualified and registered Dispensing Optician, Julie. It is important to have an eye examination as it can detect early signs of eye conditions such as glaucoma and macular degeneration. It can also detect underlying health problems such as high blood pressure or diabetes. Coverdales is contracted to North Yorkshire and York NHS to perform NHS eye examinations, and we also provide private eye examinations. 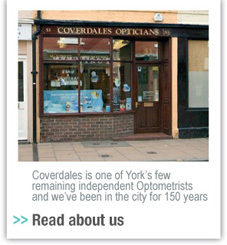 Coverdales provides a wide range of high quality frames and lenses to suit your personal needs. Our qualified Dispensing Optician is on hand to provide you with a personalised frame styling and fitting service. We take as much time as you need to help you find the perfect frame, one that you feel suits you, and that also fits your prescription. We are not limited to any one supplier at Coverdales and we source from the best manufacturers worldwide. We will discuss your lens choices with you, considering your daily routine and individual requirements. We also provide specialist lifestyle spectacles, eg; spectacles for the computer, swimming, music reading, safety specs and flying. We also offer sunglasses with either standard or prescription lenses. Whatever your choice, you will be assured it will be the best choice at Coverdales. Am I entitled to a free eye examination through the NHS? Can I get help, towards the cost of glasses? If you fall into any of the first four categories above you will get help towards the cost of glasses. If you require complex lenses you may get a small allowance. Do I need to see my Doctor before I can have an eye examination? No. All you need to do is make an appointment. You can ring, email us or just call in. We may even be able to see you without an appointment. On average about every two years. Certain people may require more frequent examinations. For example diabetics or people who have a family history of glaucoma. Children should also be seen at least every year and in some cases every six months. We will advise you when we would recommend your next appointment.